This week's workbox is these awesome laminated alphabet letters that I got from Activity Bags, which I reviewed on this blog last week. The idea is simple. Your child matches upper and lower case letters, and then checks the picture on the back of the cards to make sure they are a match. It's a great independent activity, although I don't recommend giving them all 52 cards at once. It very quickly became overwhelming for my little sprout. Another idea with the cards is to have the child sort a pile of lower and a pile of capital letters. They can also put the letters in alphabetical order. Cost: Books are $15 each or $27 for a bundle. Work for the Teacher: Buy the book, photocopy and laminate the cards. 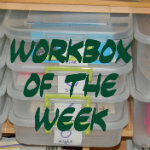 Check out my other ideas for workboxes here.